The word is BUSY…from our fields to our winery, and yes, even to our office. (Hence the late date of your September News!) Bogle is a beehive of activity as we are harvesting and crushing fruit from our estate vineyards as well as our grower partners around the state. 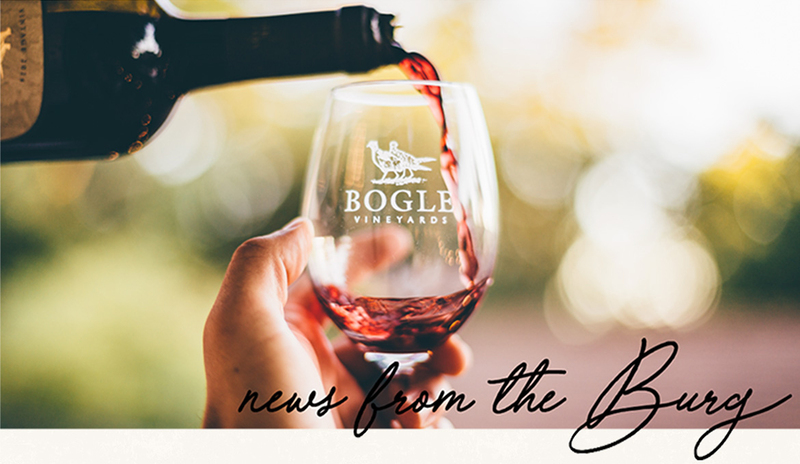 Though these wines won’t be poured into your glass until 2017 at the earliest, know that much care and attention are being taken right now to create your favorite white or red glass of Bogle. Since this is Warren’s 19th harvest, he’s been doing this and succeeding at it, for a long time. In fact, he’s practically nocturnal by now! 10am – Wake up and kiss my wife goodbye, then drive to River Ranch where our Chardonnay is being hand picked for delivery to the winery later today. Hand picking takes a lot of time, but this vineyard might become next year’s Reserve Chardonnay. 10:30am – Head to winery and walk the hill to our crush pad. Our winemaker Eric is up there, so this is a good chance for us to took at the fruit coming in from the previous night’s harvest. We both think it looks pretty good! 12 to 2pm – Winery production meeting with winemaking, sales and accounting staff. Marketing has some new promotional ideas for next year. This is also a good time to look over the calendar with my sister Jody and brother Ryan to see who will attend a couple of upcoming events. 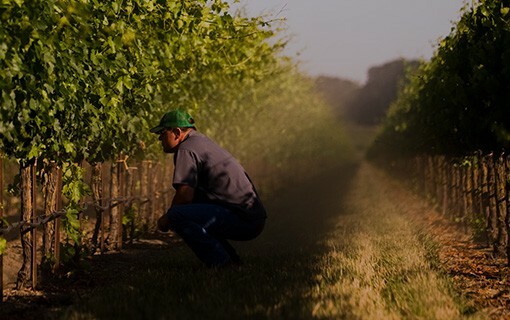 2pm – Work with winery to schedule grape loads coming in and set up the trucking schedule for that night’s harvesting. This time of year is it important to have a great relationship with your trucking company. 4pm – Get Stephanie and kids, we head to soccer practice. 7pm to 4am – Machine picking, up to 10 loads a night. Sunset from the harvester is pretty amazing tonight. I’m busy quality checking the fruit, tagging trucks and getting drivers on their way. Drive back over to the winery to see the first trucks roll in and watch the winery start their crushing at 3:30am. It looks good, so I head back out to the field. 5am – The sun’s about to come up and I start driving home. Very thankful for a another night of safe harvest and thankful for my employees who work hard to get the job done. And thank God for another day to do it all again tomorrow. In Eric’s 22 years at Bogle, much has changed during harvest, but the anticipation and excitement about the grapes coming into the winery to start the winemaking process has not. 5am – Woke and tried to get out of the house without waking 15-month-old Anya. While driving into the winery, stop and check on the hand pick starting on my favorite Chardonnay vineyard, the River Ranch. 6am – Arrive to the winery after my 2 cups of coffee, which are very effective in removing the toothpaste flavor from my mouth. With a regenerated palate, I am ready to taste wine. First up, the wine to be bottled today, the 2014 Cabernet Sauvignon. Tasting Great! After checking in with the bottling line, I head up to the crush pad. 7am – While at the crush station, I review the incoming grapes. Ramiro, the cellar supervisor, and I are working to fine tune the new crusher to minimize the amount of stems and vegetation that can pass through. This is the first time we have crushed this new grape variety: Teroldego, which Chris Smith has sourced for us. This will be a dark and full-bodied red wine. 7:45am – Time to check fermentations! I climb the catwalk and open the tops of the tanks and smell all fermentations, looking for off aromas. All smelled great today. 8:30am – Meeting with Dana, our winemaker. We go over the day’s happenings and review the schedule of fruit to be delivered. Then we taste the monthly samples of all wines that are in process of being made, about 40 wines. We make the decision to put the finishing touches on the 2015 Sauvignon Blanc blend. We are very excited about this vintage. 11am – Find Warren and talk about his incoming grapes and the grapes we have crushed. Scheduling his pics for delivery to the winery for the rest of the week. Warren picked Chardonnay, Chenin Blanc, Sauvignon Blanc and Pinot Noir this week. 11:30am – Swing back up to the crush pad to check out the fruit in the hopper. Looks good! Drive down the river to the taco truck. Tony’s has the best adobado burritos. 12pm – Production meeting with Bogles, sales and accounting departments. 2pm – Head to the lab to review the analysis of the juice and must that was crushed the day before. Winemaking instruction will be issued based on these numbers over the next couple hours. 3:30pm – Develop the schedule for the next day of grape deliveries and discuss with Dana and Julio, our cellarmaster and his team so they know what to expect. 5pm – One last trip up to the crush pad to check the incoming grapes and their sugars. 6:30pm – Arrive home to play with the baby and put her to bed. Make some salmon tacos and enjoy dinner with my wife, while sipping Reserve Chardonnay. September isn’t just harvest time for us here at Bogle, but for countless other farmers and ranchers in our rich agricultural region. The best place to soak up as much as you can is at the annual Farm-to-Fork Celebration. With events scheduled throughout the month, there is something for everyone to attend and enjoy! Come taste some amazing wines, including a couple of your Bogle favorites, at the Legends of Wine event, held on the gorgeous State Capitol steps on September 16th. Fine wine and delicious bites are a lovely way to enjoy the view of the Tower Bridge. It couldn’t be more easy to experience true farm to fork dining! Farm-to-Fork Restaurant Weeks from September 8-September 25th give you plenty of time to try our region’s eateries as they offer special menus to celebrate all the abundance of the area. Ready for the biggest block party you’ve ever seen? 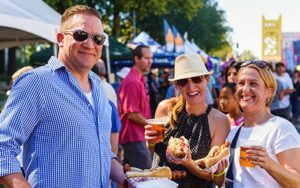 The Farm-to-Fork Festival on September 24th is the most anticipated fresh-food party, showcasing area farms, ranches, restaurants, wineries, including yours truly, of course! Bring the kids and hang out in the Kids’ Zone, watch live chef demonstrations or come to hear live music like the Wallflowers. We take over Capitol Mall from 11am-6pm! Join us!